The West uses feigned use of chemical weapons such as chlorine gas, sarin, phosphorus bombs and napalm as well as self-made barrel bombs as a propaganda weapon against Syria. To every modern western war of aggression belongs the demonization of the attack victim as well as propaganda to the alleged cruelties of the leadership of the attacked state, with which further military steps of the attackers „on humanitarian grounds“ in their media are portrayed practically as „no alternative“ and the prohibition of international law – and the UN – is wiped aside. This is usually associated with abuse of the Holocaust à la „Those who oppose the war support this new Hitler. Never again Auschwitz! „And similar brutal psycho-attacks against the population on the home front, which is purposefully thrown into an ethical dilemma. Although the US chemical weapons propaganda for disregard and revocation of international law in 2003 in the case of the Iraq war due to lack of evidence was completely transparent from the beginning, has long been unmasked by one of the responsible, the then US Secretary of State Colin Powell, who is known at that time in the UN Security Council with an alleged anthrax ampoule wagging, later called „biggest mistake of my life“ was called, the Syria attacking coalition led by the United States exactly this „poison propaganda“ not even ten years later in Syria used (1). The US has been using regionally available fighters in recent decades to overthrow governments. This is also publicly known, see, for example, the „Iran-Contra scandal“. Even today, the use of radical Islamist, mostly financed by Saudi Arabia and various Gulf States fighters by the United States in the attack on foreign countries should actually no later than the confession of the then responsible US presidential adviser Zbgniew Brzezinski to attack Afghanistan in the late seventies To be known in the early eighties. Brzezinski was friend and foe for decades as the great maker of US foreign policy or geopolitics. In 1998, Brzezinsiki affirmed statements by the then CIA chief on Afghanistan’s use of radical Islamists by and for the US even before the Soviet Union’s intervention in favor of the Afghan government in an interview with the French newspaper Le Nouvel Observateur (2, 3). The leader of the US-led attacker or at least the imported fighter was the Saudi Osama Bin Laden. He and his mujahedin fighters later became known as al-Qaida. 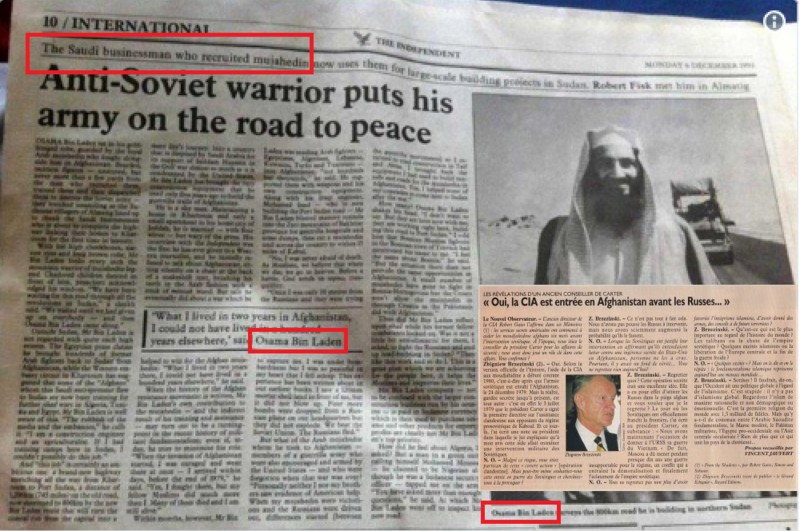 A well-known article by the British newspaper The Independent of 1993 titled „Anti-Soviet warrior puts his army on the road to peace“ courted Bin Laden as a great humanist, who builds roads in Sudan after his successful Afghanistan mission (4). That the US government arrested Al Qaeda for the ominous 9-11 attacks in the US with over 3,000 dead – the occasion for the everlasting „war on terror“, for emergency regulations and the massive expansion of surveillance and censorship by the US government – responsible, but the Syrian attack on Syriacs with the spiritual guidance of mostly Saudi preachers working together sometimes leads to bizarre, totally contradictory situations. Almost as important for propaganda against Syria as the chemical weapons propaganda is the so-called barrel bomb, a particularly offensive to the human intelligence propaganda of the West, which also reflects the media consumers a completely fake reality. These self-made bombs from old barrels are supposed to be real hell machines, which should overshadow normal bombs specially made for wars and optimized in their explosive effect. So far, however, no NATO bomber squadrons or combat helicopter squadrons have been seen to use this cheap, non-banned, and allegedly highly efficient bomb, which according to our propaganda may collapse entire multi-story homes. And in reality, the use of such barrel bombs would rather ease the suffering of the civilian population, as they are relatively harmless and ineffective – at least in comparison to real aerial bombs. In the following, the propaganda in the Syria war to alleged chemical weapons used by the Syrian government and to the supposed horror weapon „barrel bomb“ will be examined. The listed examples also include the most important propaganda events on these topics. The chemical warfare agent Sarin became known to a broad public by the sarin attack of the Japanese Ōmu Shinrikyō sect in the Tokyo subway system on March 20, 1995. At morning rush hour, sect members sarin were deployed in five trains, the fumes of which in the car as well as in the fifteen approached subway stations spread. Thirteen people were killed in this sarin gas attack. In 2013, Ghouta, a suburb of the Syrian capital Damascus, reportedly witnessed a murderous chemical weapons attack in the Syria war in which improvised sarin-containing projectiles were fired into areas of jihadist „rebels“ and hundreds of people died. Time Online, citing the US government, reported „more than 1429 dead“ (8). The French government spoke of 1729 dead (9). This event in Ghouta has been for years the great, known poison gas attack of the Syrian war and is not to be confused with the 2018 Ghouta poison gas event. „The regime has assured that it will never use chemical or biological weapons. This statement can be considered credible, since the use of weapons of mass destruction or even the movement of such weapons would mean exceeding the ‚red line‘ that President Obama threatened. A military intervention against the Syrian government would be the result. In 2013, the poison gas attack happened, which matched the 2012 forecasts so well. Perhaps because of the poor performance of the False-Flag attack, the Obama administration and its allies still saw a direct invasion of Syria. A few months after the alleged Syrian attack, US scientists from the prestigious Massachusetts Institute of Technology and Tesla Laboratories issued a report entitled „Possible Implications of Faulty US Technical Intelligence in the Damascus Nerve Agent Attack of August 21, 2013“ (11 ). The two experts – former UN weapons inspector Richard Lloyd and MIT professor Theodore A. Postol – had actually assumed prior to their investigation that Syria’s troops were responsible for the poison gas attack. Then they found just the opposite (12). The embarrassing mistake made by the creators of the False-Flag attack was that the range of the seized missiles that had or should carry the poison gas was only two kilometers, but the Syrian units were at least six kilometers from the impact locations. The fact that UN inspectors were nearby and able to secure the projectiles almost immediately was due to the fact that a Syrian chemical weapons mission had already been claimed and the UN inspectors were in Syria and in this area at that time. Appropriately, the alleged attack took place. If someone fired the poison gas projectiles, then the „rebels“ and their intelligence friends themselves. That does not mean that people or a large number of people were killed by these poison gas grenades. Of course you can also „produce“ poison gas victims differently. It is to be hoped that most of the allegedly dead chemical weapons victims shown were „only“ drugged. Of course, it can also be dead or targeted people killed for this event. As usual in the propaganda productions of the Syrian War, mainly dead children were shown. The US-based investigative journalist Seymour M. Hersh – winner of the Publishers Prize and five-time winner of the George Polk Award – published in his early 2014 article „Whose sarin?“ And his subsequent report „The Red Line and the Council Line. Seymour M. Hersh on Obama, Erdoğan and the Syrian Rebels „showed that most likely the NATO state of Turkey and the radical Islamist al-Nusra front, the Syrian branch of Al Qaeda, are the local executives behind the Ghouta poison gas attack and have used their own sarin to counterfeit a Syrian attack (13, 14, 15, 16). „More than two years later, on October 21, 2015, two Turkish MPs sit at a table in Istanbul and tell their version of the events. Eren Erdem and Ali Şeker are the co-chairmen of the opposition CHP faction in the Turkish parliament. They want to present new evidence: that it was not the Syrian army but the jihadist militia who carried out the attack. And that not Assad, but the Turkish secret service is behind the attack by Ghouta. On this August 29, the BBC’s 10:00 am morning news – before the vote – brought a more than four-minute report from two BBC journalists from Aleppo, Syria, claiming that a Syrian fighter plane was a firebomb on August 26 with a „napalm-like substance“ or thermite thrown on the playground of a school and are shown in the corresponding alleged victims and treatment measures in the „Antareb Hospital“ (20). Furthermore, the same theme with the same scenes was further expanded in the 45-minute BBC panorama report „Saving Syria’s Children“ (21, 22). Some doctors or helpers in the hospital wear clothing with the logo and inscription of the British organization „Hand in Hand for Syria“, which was founded for the Syrian war. At 30:55 minutes, the BBC Panorama reportage shows a baby who is said to have severe burn injuries. The reporter says that the baby to be seen in the scene has severe burns. In fact, there is nothing to see. The baby actually looks completely normal. Shortly after the „treatment“ of the baby come the alleged Napalmopfer in the clinic. The measure with the baby should probably give the viewer the feeling that the staff is familiar with burns. 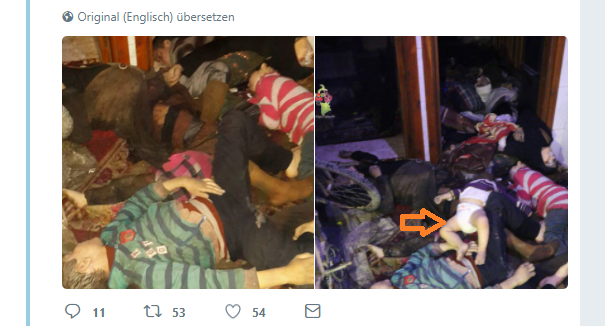 The fact that the whole napalm story can not be true, you can actually see when looking at the BBC images at first glance: Allegedly, the children and adults shown are reported to have severe burn injuries, but they behave not as such burn victims do it. Despite the alleged Napalmverbrennungen the whole body astonished again and again the hair of the amateur actors. The eyebrows are also present. Brand blisters are not seen on any of the victims. In general, it should be noted that the masquerade of the performer does not even look like severe burns, burns 2nd or 3rd degree. At 32:25 in the BBC panorama video, a boy walks around the area bored with skin supposedly torn to shreds, but his hair is miraculously scorched, and is still controlled by adults. Rather reluctantly, he runs after a kick-off by a man dressed in yellow for treatment in the hospital. It turns again curious around to watch the latest acting performances at the courtyard entrance of the clinic. There are no flesh under his „skin rashes“, just normal skin. He was simply stuck with the scraps. A British doctor explains from minute 37:52 that most of the patients have burns of 70-90% of the skin surface, which is medically – in view of the pictures shown – completely impossible. As she says this, the video runs by way of illustration for the boy who was plucked in the yard by the yellow-clad man. The reporters of the BBC were traveling for this story with a car of the terrorist group Ahrar Al-Sham, which is banned in Germany (24). This can be seen by the logo of the group on the car. The 3rd Criminal Senate of the Stuttgart Higher Regional Court sentenced four defendants in 2016 to „imprisonment for supporting the alien terrorist group ‚Ahrar al-Sham'“ (25). They had brought equipment to Syria for this group, especially military boots and parkas. From 10:50 minutes on, the BBC terrorist convoy passes jihadist flags, which are probably a kind of turf mark.It seems to be the flag of the „Islamic State“ – IS – (26). Also in the action in the clinic this flag can be seen.One thought at the BBC probably, one would have cut out all appropriate places from the BBC panorama video.But from 32:40 minutes and from 36:30 minute is an ambulance can be seen, which has the flag large format behind in his window. On March 16, 2015, there should have been another chemical attack on the civilian population in the town of Sarmin in the province of Idlib with chlorine. 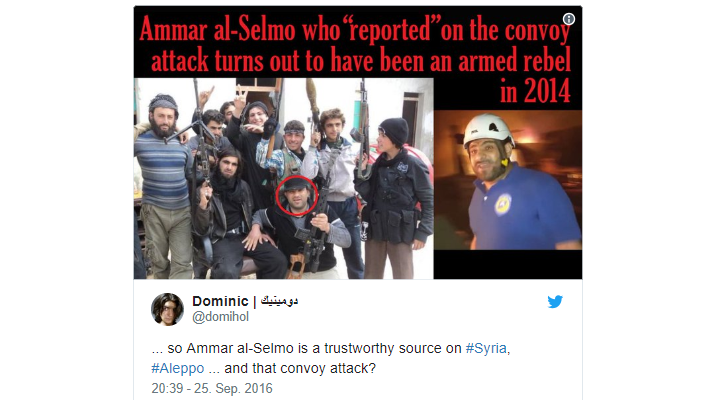 With the supplied propaganda images the White Helmets, the „local authorities“ – Al Qaeda – and our media but again and in a rather sad way revealed: The propaganda images show namely the murder of a boy in front of the camera to produce suitable propaganda images à la Pulp Fiction for us western pop culture junkies. In response to a small request from the party The Left to the German government funded by the German government, the Federal Government in early 2018 in an incredibly arrogant manner by numerous diversionary maneuvers tried to cover up the murder of a young boy for propaganda purposes by just these white helmets (27 , 28, 29). Although the evidence in view of the video material is clear and comprehensible to laymen, the federal government also tried to discredit the Swedish Medical Association, which made the child murder public.Even before, the ARD had refused to report on the murder despite knowing (30, 31). The two videos released via the Youtube channel of the White Helmets of the Al-Qaida region of Idlib were designed to simulate medical treatment following an alleged poison gas attack by the Syrian government in Sarmin, Syria. The second video shows how an unconscious boy is killed by a syringe in the context of a simulated treatment, which is supposed to be an „adrenaline injection à la Pulp Fiction“ (32). In the first White Helmet video, the suspected opiate-struck boy is still conscious (33). When he gets a syringe in the heart several times in the second video, he is already unconscious. He could theoretically have died by the stunning.In any case, the stings were deadly to the heart. In the corresponding scene with the little boy from about minute 1:05 onwards in the second Youtube video, he is stung four or five times from different angles into the chest area in the area of ​​the heart (34). It is „herumgemantscht“ in the chest with the syringe needle. All this happens very strikingly, a show. The bad doctor actor with the syringe does not even press, that is, he does not even inject the supposed adrenaline.The white helmets sting several times in their victim child as in a doll, as if it were not a human being.Everything for propaganda images of a supposed poison gas attack. The two videos were produced by the white helmets together with the organization „Coordinating Sarmin“, whose logo contains an al-Qaida flag, as the Swedish Medical Association mentioned at the beginning of this study has been able to substantiate in its investigations (35). The videos uploaded via the youtube channel of the white helmets contain a logo of the white helmets and can still be found on Youtube today. Led by Professor Marcello Ferrada de Noli and Professor Anders Romelsjö, Swedish SWEDHR Humanitarian Association analyzed the two White Helmets videos. The doctors found that the videos were counterfeits and that the alleged „rescue measures“ would have ended in an emergency, especially the „adrenalin treatment“ of the little boy. In addition, the children showed no signs of chlorine gas poisoning. The medical association SWEDHR also had the spoken language translated into Arabic for the analysis (36). It turned out that even a direction statement for the positioning of the victims were included: A woman should lie down, the children are draped on her. Even without a director’s statement you would have to ask yourself: Which actual doctor stacks his patients on top of each other? SWEDHR pointed out in this context that the videos were screened in the UN Security Council behind closed doors, without translation or subtitling. 15. Does the Federal Government have the benefit of the „Swedish doctors for human rights“? Is she coming to an end? „Questions 14, 15 and 16 will be answered together. The „Swedish Physicians for Human Rights“ (SWEDHR) were appointed by the Swedish physician Dr. med.Founded by Marcello Ferrada de Noli, who regularly publishes articles on state-related Russian media such as „Russia Today“ or „Sputnik“. The Federal Government’s answer, like the rest of the Federal Government’s response to the Small Question, is pure propaganda in favor of White Helmets (38). Let’s start with the second paragraph of the answer: The Federal Government has proven a chlorine gas attack, which is a strong proposition not only because of the video material shown, but also because of the low effectiveness of chlorine (39). Then you ignite a smoke candle, that the persons shown are probably not white helmets. Okay, but even if we have a White Helmet video with the White Helmet logo uploaded by the White Helmets in their White Helmet channel on Youtube, which of course also includes a beautiful White Helmet logo. Apart from the first paragraph, this was all that the Federal Government had to say. On the video content she did not enter, probably in the mistaken belief, not to incriminate, if she does not say so, or to get around the topic. That science, reality and the findings of the Medical Association – or any other who looks at the videos – are invalid, the Federal Government explains to us in the first paragraph so that the chairman of the Medical Association the case of „Russia Today“ and „Sputnik“ known made. That makes you speechless. 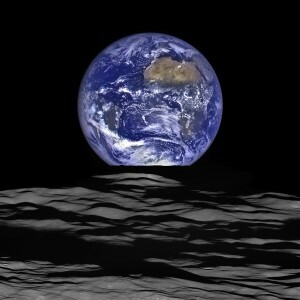 If the Russian says or even passes on, the earth is round, then that can not be true. Then the earth has to be a disk? Will the Federal Government say that to us? Of course, SWEDHR also tried to make the case known to other media, but fell on deaf ears. The Western mass media ignored this scandal of West German-funded white helmets. Only the ARD went after the case after a while. However, not to report on it, but because the chairman of the medical association Russia Today had given an interview and the ARD was of the opinion that the statement of the professor had been misrepresented by RT (40). However, the SWEDHR chairman, Professor Ferrada de Noli, confirmed to the ARD in a detailed letter that his statements were correctly reproduced by RT (41). The ARD knew with absolute certainty of the serious crime of white helmets, but lost in the following a word about it. The Federal Government hushed up the crime in its response to The Left actively and with a contempt for human beings that is second to none. Later, Angela Merkel’s Foreign Minister Heiko Maas called the white helmets that had come to the state visit in Berlin on 17 August „a strong symbol of humanity and hope“ (42). The April 2017 Chan-Sheikhun incident was known to spark US President Trump’s missile strike on Syria (43).As always, there are no air monitoring data showing Russian or Syrian aircraft at the crime scene in question at the time of the crime in question. However, this created confusion that initially several miles away and at a different time taking place of Russian aircraft with the Chan-Sheikh attack was associated. 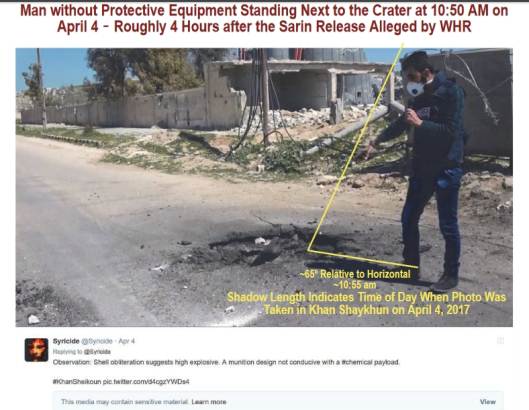 With regard to the pipe „found“ in the crater, which allegedly contained the deadly sarin chemical warfare agent and is said to have been dropped from a fighter jet, Professor Postol’s analysis concludes that the pipe is placed on the ground and was not discarded (45). 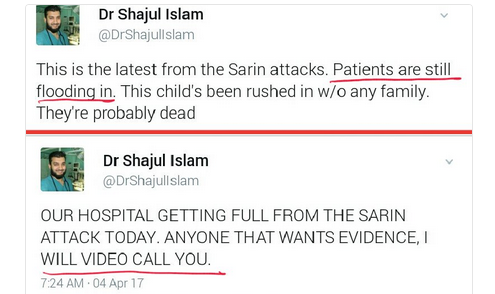 During the allegedly chaotic emergency situation in the hospital due to the „sarin attack“ tweeted a doctor and offered interviews. Incidentally, the doctor is British and has been charged in the UK with abducting two journalists in Syria – John Cantlie and Jeroen Oerlemans – and has left for Al Qaeda in Syria. (46, 47). The alleged medical measures shown in the Weißhelm videos are as always hair-raising and have nothing at all to do with the treatment of sarin victims. Again, with the massive use of children mood is made. At least some of the children could have just been stunned as in the aforementioned Sarmin incident. And if you want to make propaganda with a false flag chemical weapons attack, you should at least make sure that the alleged poison gas victims are not delivered before the alleged attack date in surrounding clinics. N Not even the OPCW’s official investigative report for the UN, which was heavily influenced by the West and faked with samples, was about to mention this on page 29 (48). 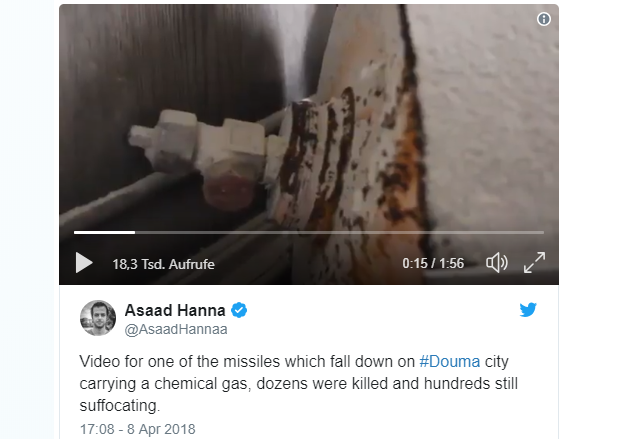 The second major alleged poison gas attack in Syrian Ghouta near Damascus took place in April 2018. The German Syria expert Professor Günter Meyer of the University of Mainz clearly stated that this is a false flag action of the Weißhelme in an interview in the ARD-Mittagsmagazin (49, 50). Photos prove the fake. 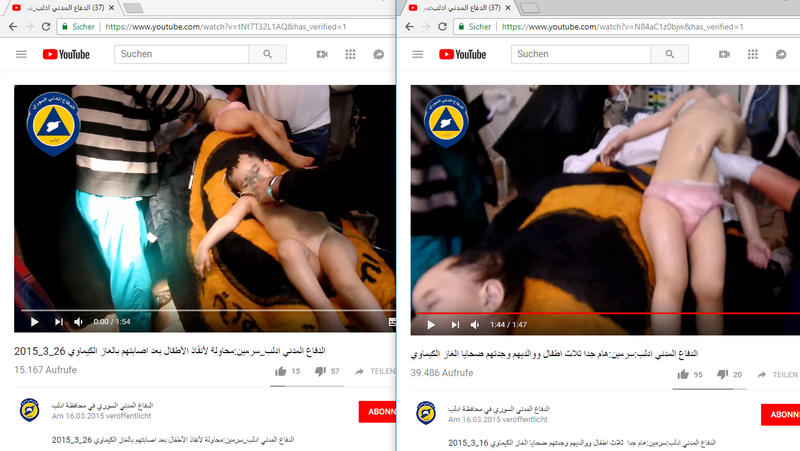 Two pictures of the alleged poison gas attack circulated on the Internet and supplied by the terrorists – see above – show different variants of the same situation. On display are dead women and children or involuntary victims: Let’s hope they were just stunned. Let’s take a look at the people in the two pictures, which are the same situation. In the right picture you just have a baby added. Other details differ in the two pictures. Two more pictures – screenshots from videos on the same situation – also show different variants. Again, the same situation with a different number of performers is contested: In the left video clearly two children are more to see. However, the baby of the one previous picture is not included this time. The station CBS has tried to spend one of the alleged poison gas attack after the US air strikes hit building in Syria as a chemical weapons factory and thereby involuntarily with the own footage even the lie convicted. In a video contribution from the broadcaster, the journalist stands in front of the destroyed building, allegedly a toxic gas factory and research site by the OPCW in 2013, according to the US government’s allegations and despite the destruction of Syria’s toxic gas stocks in 2013 (51). CBS also talks about producing biological weapons in the building complex. 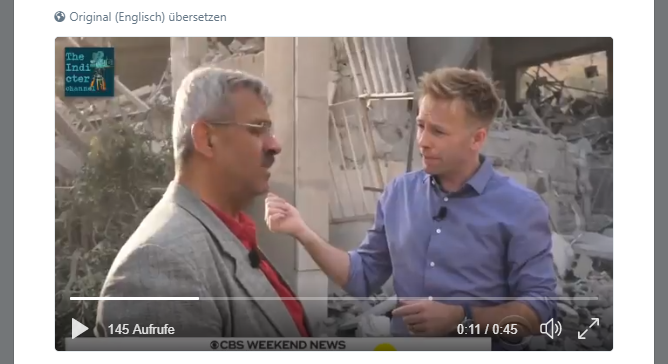 How can the CBS journalist and the other people in the picture stand there directly in front of a destroyed chemical weapons plant, so without protective suits, surgical masks, gas masks and so without any symptoms of poisoning? If it had actually been a research, production and storage facility for poison gas, biological weapons and CO, that would be completely impossible. The last of the part is a quotation from British Foreign Minister Boris Johnson, who uncomplies the news as the official truth passes and fooled the viewers that Syrian chemical weapons depots were hit. In the filming of the white helmets of the alleged poison gas attack in an emergency department in Duma to see people later said in the headquarters of the OPCW in The Hague in the Netherlands that the whole theater was just a staging and they were splashed with water and had no symptoms of intoxication. The video from the emergency room had previously been played in our news up and down, as alleged evidence of a chemical attack (53). The reporter sniffs at a school frock, which belongs to a girl from Douma and which should be soaked with the allegedly used in Douma warfare sarin. The lady deserves a nomination for the Darwin Award, because to want to sniff out an extremely deadly chemical substance that kills the air would of course be completely wrong – if the good piece were indeed full of it. 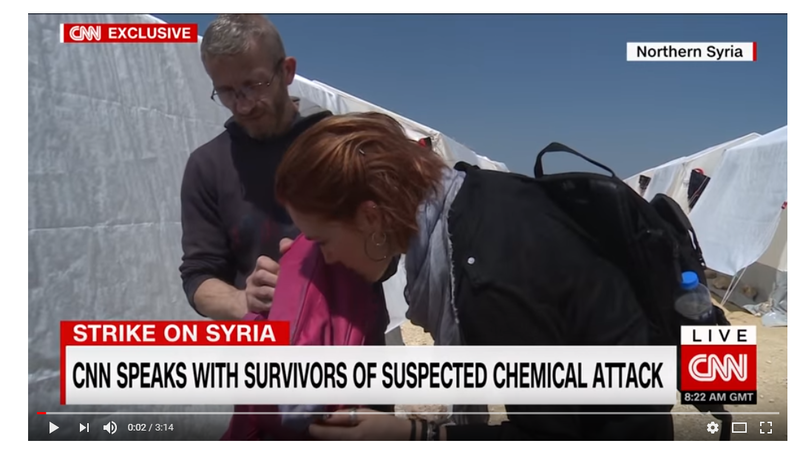 The woman acts as if this is a piece of evidence full of chemical agent and confirms with impressive facial expressions several times that the satchel stinks, which is supposed to be evidence for sarin in their eyes. A sporty achievement of the journalist, after all, Sarin is an almost odorless, relatively volatile liquid. Through her behavior, the American reporter herself is convicted of lying. One liter of chlorine gas weighs 3,214 grams. 125 kilos are almost 40000 liters of chlorine gas. According to Weißhelmen and Co, a poison gas container in Duma is said to have crashed through the ceiling of an apartment, only to come to a butter-soft halt on a bed without destroying it (56, 57). It is of course completely unrealistic that this floor first breaks through the concrete floor, but then does not smash the bed, and that also with a rather bizarre trajectory. How the broken window should come to the bed, probably remains a mystery forever. The apparently intact valve on the „rocket“ gas bottle designated by an „activist“ also does not contribute to the credibility of the statements of the „rebels“ (58). Maybe one should import such technical marvels in Germany, because in this country one has far greater problems with the safe handling of gas cylinders and the danger of the tearing off of the valve than in the al-Qaida areas (59). The Syrian government has always denied using such bombs that can not be dropped from fighter jets, but are supposed to be used in Syria – supposedly – typically from helicopters. For example, in response to a Western journalist’s question about this „horror weapon“ in 2015, the Syrian president said that they did not use barrel bombs: „We have real bombs!“ – better, stronger, more terrible! In fact, there is no real evidence for the use of such bombs in Syria. 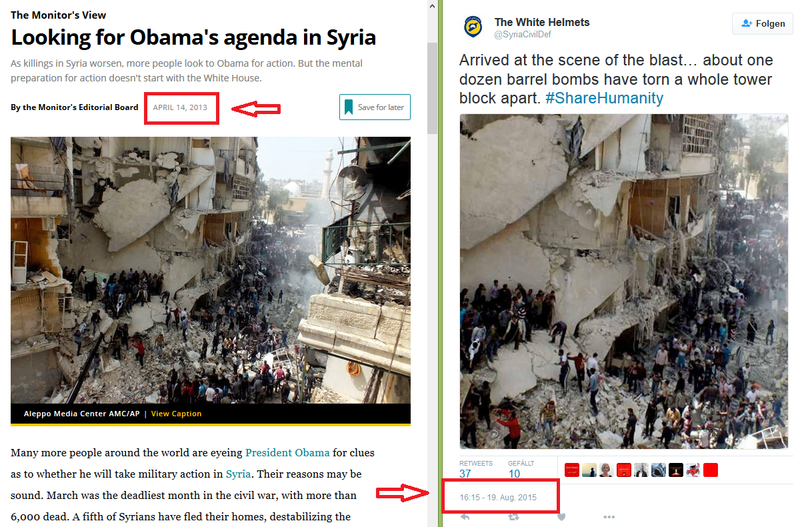 There are only false pictures or false reports such as a particularly embarrassing forgery by the White Helmets, in which one simply used a picture, which was used in 2013 before to make mood against Syria, two years later, once again to one (60) to „fake a barrel bomb attack“. The main suppliers of propaganda images for the Western media from Syria are the White Helmets (61). A pseudo-rescue force founded in 2013 by British military service provider James Le Mesurier, who claims to have spontaneously launched the project in Turkey together with Turkish earthquake rescuers (62, 63). White Helmet Director Raed Saleh even referred to an Earthquake Strength of 8 „on the Richter scale“ when receiving the „Right Livelihood Award“, which was also marketed as the „Alternative Nobel Prize“, with a number of 50 dropped casks every day (65 , 66). Saleh also said that the fatal earthquake in Italy had only the magnitude of 6.2 and deliberately related it to barrel bombs. Not only geologists would have to break out with such information in loud laughter. Barrel bombs and phosphorus bombs! „The controversial weapons, which can result in cruel burn injuries, but were only used as ’signal weapons‘, stressed the US military. Actual use of phosphorus in Aleppo would have been spectacular and certainly filmed, albeit not by anyone in the direct target area. The whole thing would not have been concealed. Corresponding pictures were never submitted. “ Anyone seeking help in a hospital in Syria faces mortal danger. Eleven hospitals supported by MSF have already been bombed this year. Many people have lost their lives. Most recently, Al-Kuds Hospital and neighboring buildings were destroyed in an air raid in Aleppo, killing at least 50 people, including six hospital employees. The survivors report that two barrel bombs hit the adjacent buildings first. Then a third bomb blew up, this time at the emergency room entrance, where doctors and caregivers took care of the wounded. „. Even if barrel bombs were used in Syria, you would not bomb a whole hospital or buildings with this weapon.Pictures of the alleged hospital from the morning after the attack, which were also to be seen en masse in German media, show that this has just not been destroyed and sandbags are completely intact on the building.The previously damaged building does not look as if it had been completely destroyed during the night. Videos from the alleged bombing night confirm the impression: The sandbags are neatly piled up at the entrance and on the outer walls of the building (72). No murderous super bombs can have destroyed a large building here, even if the white helmets play so nicely with the debris placed in front of the building. 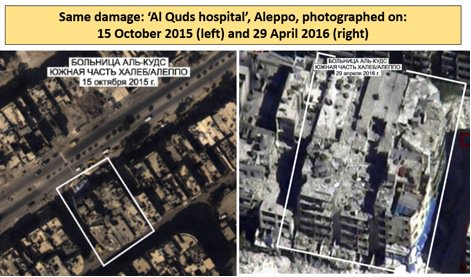 The alleged Al-Quds hospital offered as early as 15 October 2015, the same damage as on 29 April 2016, after the alleged attack, which is said to have completely destroyed it (73). „Doctors Without Borders“ supports the white helmets and alleged hospitals, for example, with materials, but is not active even with local doctors. „Doctors Without Borders“ reflects what the „local rescuers“ of the White Helmets have reported. The media, in turn, shouted „according to Doctors Without Borders“ and conveyed the impression that a hospital had been bombed by „Doctors Without Borders“ here. This is probably not even a hospital building. A video is supposed to show the attack on the emergency room from the inside (74). How had it been called „Doctors Without Borders“ and the mass media? A man stands on a pedestal in front of the front door of the alleged hospital, which, as we have seen above (and from another angle, from the front), yes is perfectly accessible. He yells at the white helmets in front of him: „Get my son out! My son is here! „. The white helmets are meanwhile wielding sandbags on the floor and apparently have no intention of simply entering the building. You could say that they perform a bizarre dance number, where they sweep the floor with the sandbags like a cleaning crew. And behind the man there is still light in the entrance area. The New York Times has published the White Helmets video to which this scene belongs and titled „Divided Aleppo Plunge’s Back Into War as Syrian Hospital Is Hit“ (75). Exactly what is in the title, was probably the goal of this propaganda event. This case is a prime example of the „humanitarian hospital propaganda“ that was used in the Syrian war, especially in 2015-2016 (76). According to Weißhelmen and media propaganda, a new „last Aleppo Children’s Hospital“ was bombed every day for weeks on end, and pressed down on the lacrimal gland. 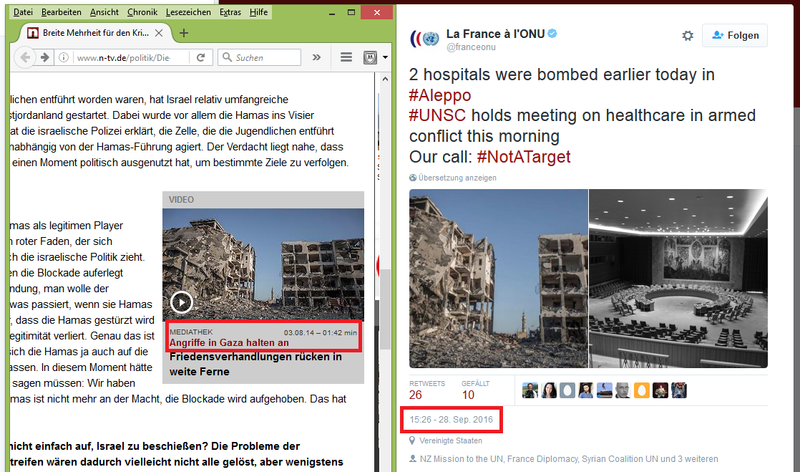 A particularly sad example of jihadists ‚and western governments‘ propaganda collaboration is the tweet of the French UN embassy of September 28, 2016, which presents an allegedly current photo showing the destruction of hospitals in Aleppo, Syria, by the Russian or Syrian Air Force , The same picture was used more than two years ago, for example, on 3.8.2014 in an article by n-tv showing Israeli destruction in Gaza. And not in Aleppo. Illustrated is the message of the alleged attack with the false image and a picture of the UN Security Council. September 2016: The United States and Russia have agreed that bombing the West with Al Qaeda’s blessing and a rest for the other, supposedly „moderate“ rebels. The latter, however, refused to separate themselves from their Al-Qaeda colleagues, as the US government noted „with regret“ (79). After a supposed „attack on the aid convoy“ by the Syrian government or Russia, the poor „rebels“ were again the victims and heroes in their entirety. Maintained by the Red Cross’s Arab variant of the Red Cross, the aid convoy was launched from within the territory of the Syrian government and was intended to bring supplies of civilian population to the areas held by the „rebels“. In order to prevent the arrival of the convoy, it would have been better if the Syrians did not send it off … The fact that the convoy came from the government area was hardly ever discussed in the Western media (80). By the way, the Red Crescent riders were replaced on the front line against „Red Crescent Riders“ from the „rebel area“, alleged dead of the attack were never shown. „Even though it’s hard to judge from the few pictures, the bombed-out steel of the bombshell indicates that this bomb actually exploded somewhere. At some point, somewhere, but certainly not at the site! 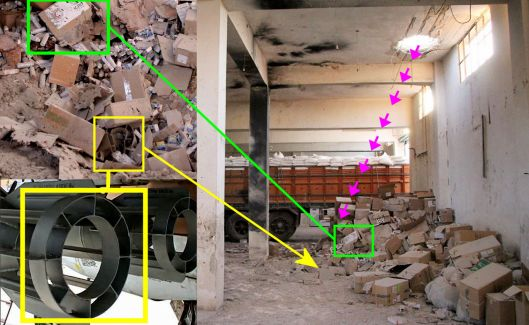 According to the Bellingcat „experts“, the bomb came through the hole in the ceiling and landed on a pile of cardboard boxes with supplies. Points 1 and 2 are canceled, because then you would not see any bombers here or in view of the bomb contents of 92kg military explosives no boxes. Even if the bomb had been a dud – point 3 – they would have been found and not just the ripped rump and that would have given an even better „proof“. The white helmets regularly abuse children for their propaganda staging. The images of burrowing or running White Helmets with young children are her trademark, so to speak. There are many white-helmet videos in which it is clear that boys and girls have been dumped in the rubble or in columns of bombed buildings in order to „save“ them theatrically. The white helmets „always“ know exactly in their „rescue operations“ exactly where the child is. Sometimes they bring children, who do not even have a scratch, out of debris. Some children have also gotten worse in his role as a victim actor: It is buried under rock and has to hope that the air hole is sufficient to breathe, until the white helmets are done with their excavations. Here’s an example of a baby allegedly spilled by barrel bomb attacks: In a video from October 2015, the white helmets placed the infant in a rubble column from which he hangs upside down. Then he is pulled out. Later, the White Helmets and „The Syria Campaign“ marketed the child as a „miracle baby“ and as a hero herself: „The heroes and the miracle baby“ (84). The case is also a good example of how parts of the UN are repeatedly infiltrated by the West, especially the US, and misused for propaganda. The fake video is from the Youtube channel „UN Humanitarian“ of the UN Organization OCHA – Office for the Coordination of Humanitarian Affairs – angeprießen (85), whose leader was at that time the Briton Stephen O’Brien, who was previously British Parliamentary Deputy of the Was conservative. In a video that was released on Youtube on 17 June 2016, the white helmets race allegedly to a mission, while in a rubble-filled street felt eternal through the area until one suddenly accomplishes a heroic à la „Look, next my feet are a child „(86). That was not there the whole time, but a video cut later it is in the picture – it has obviously been deposited in the meantime in the dirt – and can then be „saved“ immediately. The „rescue measures“ in no way correspond to a medical standard. A May 2016 White Helmet video shows a „rescue“ in which the deposited child comes out of the rubble with fairly clean clothes and a clean face (87). The little girl was deposited under a concrete slab and is then taken sideways out of the „hiding place“. It would be clear that the girl would not look that way if it had actually been trapped under massive rubble after an air raid in a collapsed building. A May 2015 video produced by jihadists or intelligence officials allegedly shows casualty bombing of Syrian soldiers from a helicopter. The soldiers allegedly filmed themselves dropping the bombs. Then the helicopter would have crashed. Then you would have found the video in it. Then „Syrian journalists“ would have come to the video and would now present it to the world public. That’s the propaganda story. But it’s good that this video was released. Because it provides a wealth of evidence on the subject of „barrel bombs“. The propaganda unintentionally exposes even the barrel bomb as Propagandalüge. The Focus titled the video with „horror weapons from the helicopter. This barrel bomb video exposes Syria’s dictator as a liar „(89). It is simply said that these are Syrian soldiers. One can, for example, just put each of the al-Qaeda rebels in a Syrian uniform and that’s exactly what they did here. The „horror weapons“ are, as you can see in the video, three rusty barrels with a lid on top. Between lid and barrel clamps a cloth or a sack. In the case of an explosion of such a barrel, the lid would probably fly away and the already low explosive power would be even lower. What should be „horror“ on the barrels compared to a normal bomb remains the secret of the Focus. It is interesting that you see no explosion on the ground after the dropping of the barrels. Even earthquakes or earthquake-like destruction is nothing to see. Which is the question anyway, what should be taken there. The forest or the road? Does not war propaganda tell us permanently that the Syrian barrel bombers would constantly attack marketplaces and children’s hospitals? Even this is nothing to see in the video. And how is it possible at all to reach a small marketplace, a school or a children’s hospital from this height from a helicopter and without an aiming device by hand with an old barrel without a bomb tail? Airborne data was never provided for alleged air raids with barrel bombs or chemical weapons – in any case – confirming that at the time and place of the alleged attack an aircraft or helicopter was present in the relevant airspace. No radar data, no satellite data, no aerial surveillance photos, no drone films or similar. Just nothing. Not even fake data. And that, even though Syria is probably the best monitored country in the world right now. The launching of a Russian SU-20 bomber by Turkish F-16 fighter pilots in the Syrian border area with Turkey was not just a problem for Russia, but also for the NATO country Turkey. A presence of a jet or helicopter does not mean that it has launched an attack. But conversely, it is of course excluded that such an attack has taken place, if just no flying machine was on site. Of course, that alone is sufficient proof that the alleged incidents are fakes. Nevertheless, if the propagandists still firmly believe that these air raids have taken place, it also shows how stupid they can hold their own people. The creation of the desired, false reality regarding Syria with „moderate rebels in the civil war“ – although, for example, tens of thousands of extremist fighters from abroad were carted – is only possible through a massive, permanent and extremely line-loyal propaganda campaign of its own media corporations, denying even the toughest scientific evidence (92, 93, 94, 95). This article is a translation of my original german article „Giftgas und Fassbomben“. It was translated with a free translation tool. So there might be some little translation mistakes.